engineering info for various jetting combinations that are provided. For drag racing, circle track, road race, & high speed racing assaults. For auto & boat racing. Jetting trends for tuning for air density are also provided to assist last minute tune-up adjustments in the staging or pit lanes. JETTING COMBOs presented in 21 detailed tables, with explanation & discussion. UP & DOWN NOZZLE SETUPS: While two or more nozzles per cylinder are not covered, the simple math provided in this manual can be used to determine those nozzles as well. 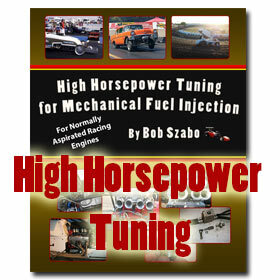 FOR TURBOCHARGED MFI ENGINES WITH WASTE GATE BOOST CONTROL: Nozzle info from the manual applies to the normally aspirated nozzle set for turbocharged MFI engines with two nozzles per cylinder; whereby the normally aspirated set of nozzle is used for starting, idling, warm up, & driving around. A second set of nozzles for boost is not covered; however the simple math provided in this manual can also be used to determine those nozzles. Volumetric efficiency – 14, 17-18, 23, 32-62, 64, 67, 70.